Pure Land Notes was first produced in the early1970's as a simple newsletter by a small group friends who had for themselves discovered or been 'touched' by some form of Pure Land Buddhism. These people were not converted to Buddhism by anyone apart from the Buddha himself, and through study of the very few text books on the subject available in English at that time. PLN is not produced for profit; it is produced to encourage communication between members and the sharing of thoughts on Pure Land Buddhism and peoples personal experiences of it. Subscription to PLN helps us achieve our aim of breaking even. Thank you! Annual subscription to 4 quarterly issues of the hard copy Journal of 20 A5 pages is only £15 UK, £17.50 Europe/Mid East, £20 USA/Far East inc. p&p. To subscribe to PLN or order back issues please use the link to the chomonhouse.orgPay Point Page at top and bottom right. 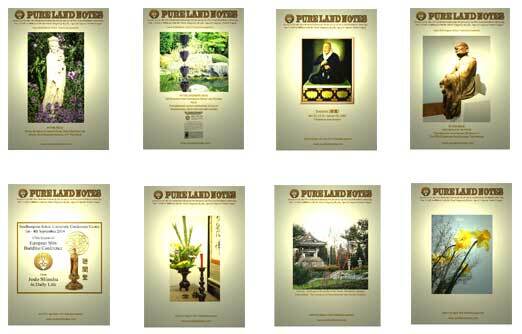 If you have a PayPal account you can to subscribe to PLN or order back issues by paying to gary@purelandnotes.com. If you prefer to communcate with me directly in regard to paying for subscription by a cheque in the post, to order individual back issues or simply make any comment please email: gary@purelandnotes.com or phone me here at my home office on (023) 80 837 145. Postal address below.